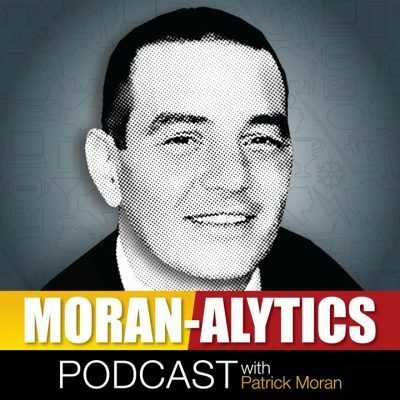 On this episode of the Moran-Alytics Podcast, Patrick Moran is joined by recurring guest Aaron Quinn of Cover 1 to discuss a trio of hot topics. They start with the Masters, where Tiger Woods shocked the world on Sunday by completing a comeback once thought improbable, winning the 15th major of his career and his first in 11 years. Moran talks about how he was so nervous he literally couldn’t sit still while watching, naming this Woods triumph one of his top five favorite sports memories of his life. From there they talk about the much anticipated Game of Thrones finale season premiere and get into a discussion over whether weekly shows or binge watching makes for better television viewing. While both enjoyed the premiere Quinn felt a little let down while Moran was giddy about the plethora of long awaited reunions. Both expect the tempo to pick up over the last five episodes and Moran claims that not having a vested interest in any specific character will make the final episodes less stressful for him to watch. However, the main focus of the podcast is on their latest Buffalo Bills four round NFL mock draft and the guys deliver a third in a series of four. This mock features four of five new picks from last week, including essentially a redshirt defender for 2019 in round two and a wide receiver in the third that sparks a conversation revisiting how all the work the Bills put into the offensive line during free agency has afforded them the luxury of selecting players based on value over need. It’s a must listen for Bills fans that provides excellent insight to the draft, now only nine days away. You can follow Aaron Quinn on Twitter @AaronQuinn716 and check out the work of his colleagues over at Cover1.net. Sandwiched between Moran and Quinn is a movie of the new Pet Sematary now in theaters, a remake of the 1989 thriller by Sean Chandler. Chandler’s the host of one of the popular movie review Sean Chandler Talks About” on YouTube, which is up to nearly 100k subscribers and growing daily thanks to Chandler’s engaging daily content. Next time you’re on YouTube, make sure to check out and subscribe to his Sean Chandler Talks About channel.